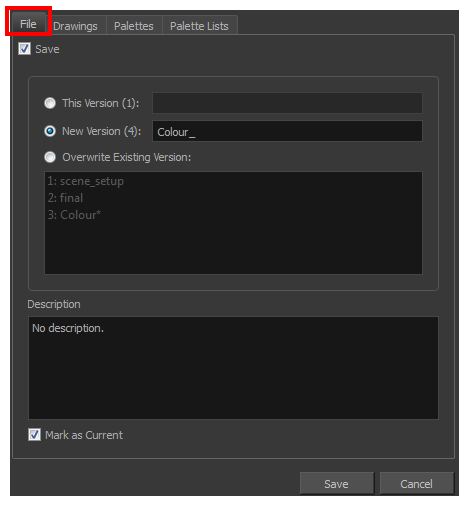 In Harmony Server, the Advanced Save dialog box lets you save the scene as a new version, overwrite an existing version, set a new current version, display a list of modified drawings, colour palettes, and modified colour palette lists. For tasks related to this dialog box, see Saving a New Scene Version in Harmony Server and Advanced Saving in Harmony Server. ‣ Enable this option if you want to save the modifications made to the current scene. 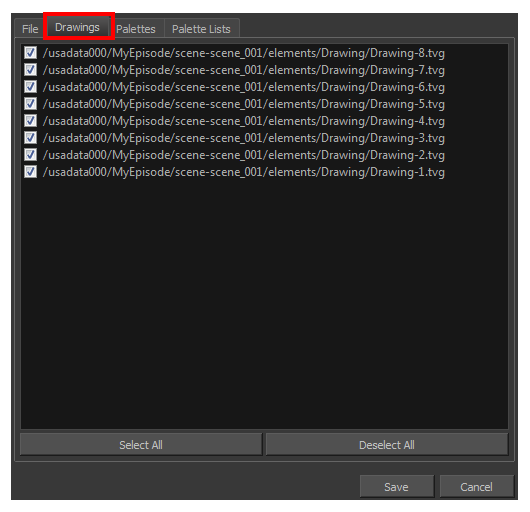 ‣ Deselect the Save option if you only want to save specific components of your scene listed in the Drawings, Palettes or Palette Lists tabs. This will disable all option in the File tab. This Version (number) Saves the current version of the scene. You can rename the current version by typing a new name into the field. New Version (number) Saves the current scene as a new version. You can name this new version by typing a name into the field. 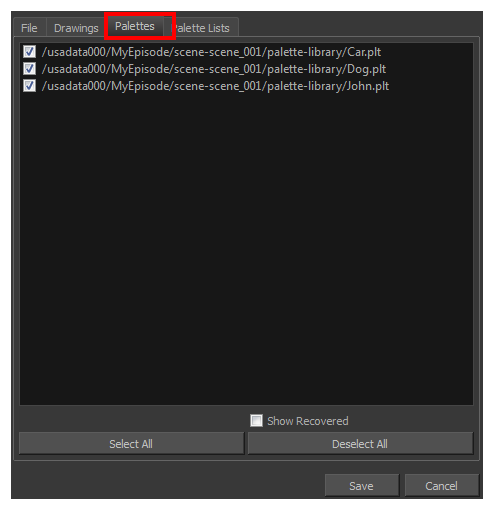 Overwrite Existing Version Lets you select an existing version of your scene from the list to overwrite it. 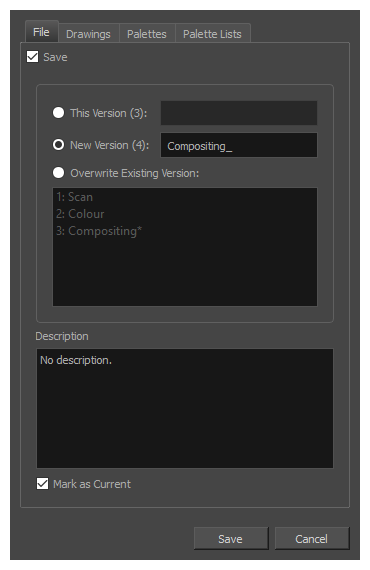 Use this field to add or edit an existing description for the scene version you want to save. The Drawings tab lists the modified drawings. 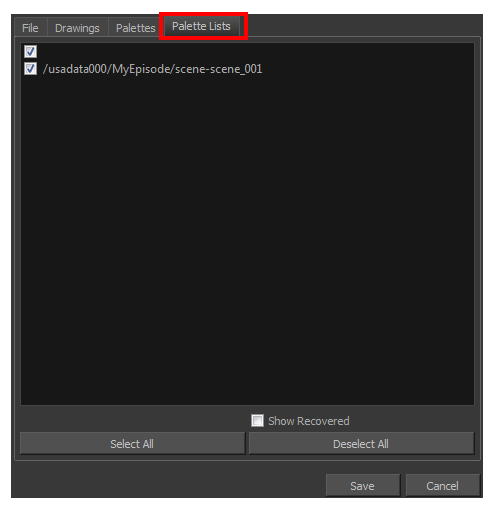 Lets you select the modified drawings to save, and deselect the ones you do not want to save. Select All Selects all modified drawings in list. Deselect All Deselects all modified drawings in the list. The Palette tab lists the modified colour palettes. Lets you select the colour palette to save, and deselect the ones you do not want to save. Displays the recovered palettes in the list of modified palettes. Select All Selects all modified colour palettes in the palette list. Deselect All Deselects all modified colour palettes in the palette list. The Palette Lists tab lists all the modified colour palette lists. Lets you select the modified palette list to save, and deselect the ones you do not want to save. Select All Selects all modified palette lists in the list. Deselect All Deselects all modified palette lists in the list.